This 10-week series chronicles the Lewis and Clark Voyage of Discovery through the Siouxland area – including their travels from the southeastern Nebraska to central South Dakota. "Your...mission is to explore the Missouri River.... Take observations.... Make yourself acquainted with the names of nations and their numbers..... Worthy of notice will be the soil, the face of the country... its growth and vegetables... the animals... and the minerals." --- Thomas Jefferson, to Capt. Meriweather Lewis, commissioning the Voyage of Discovery, 1803. After the “Voyage of Discovery” departed Camp Wood near St. Louis on May 14, 1804, they stopped at St. Charles for five days, where they added more supplies and hired ten French traders they met on the river. These “engages,” ("hirelings") were returning from trading with the Indians past the mouth of the Platte. They would act as guides, interpreters, and extra hands on the river voyage. Two other traders would actually enlist as members of the expedition. Starting again in earnest, the order of travel became set. The engages rode in one of the pirogues, while Corporal Warfington and six soldiers were in the other. The keelboat, containing most of the supplies, followed. Lewis and Clark called it the keelboat. The men doing the sweating called it a barge. Considering it was eight feet wide, over fifty feet long and could carry 12 tons of provisions and 28 men, barge is a fair name. History has decided on the more picturesque name of keelboat. Considering its size, the keelboat followed with difficulty. The pirogues, smaller boats 35 to 40 feet long, were far lighter, and rode higher in the water. They could pass sandbars and tight spaces with less effort. Clark reported on the keelboat “the 20 poles and oars could with much difficulty stem the current” - if they weren’t in the main channel of the river. There, he said, it was almost “impossible to resist its force by means of oars or poles.” This forced them to travel in the eddies near the banks. Eventually the party found unless they could use the sails, the easiest way to move the boat was to drag it up the river, using a cable attached to the bow or the mast. The men trudged forward on the banks, or sometimes in the riverbed, pulling the boat upstream, past grasping sandbars and dangerous submerged trees. But the path near the edge was not always the easy one. Obviously, the sight impressed Clark, and the continual nature of the collapses and the number of near-misses led him a year later to note his surprise that they had not been engulfed by one of these incredible landslides. Hunting groups prowled the land on either side of the river in search of game, sometimes staying out more than a day. Captain Lewis and a few others explored the land and streams, returning each night. Trained by Jefferson on the scientific study of plants and animals, Lewis spent most days ashore, collecting and cataloguing everything he thought was new or different. He would list 38 plants between the Platte and the Mandan villages, 19 of which were previously unknown. Unfortunately, his daily journal, if he kept one, is lost, depriving us of his views of this new region. Captain William Clark, the better boatman of the two, spent more time aboard the boat, recording headings to detail the map of the river. When he got the chance though, Clark, too, explored the land. Always distinctive with his red hair, Clark must have cut an interesting figure on the shore, since he used a "dainty" umbrella to protect himself from the scorching sun of the plains. As they progressed further up river, the crew's clothing changed as well. The heavy army shoes were discarded in favor of moccasins, and buckskins soon became the normal attire. Their daily schedule, depending on the weather, usually started at sunrise. They struck camp and traveled until 9 a.m. before stopping for breakfast. Back on the river, they'd plow forward until a good site presented itself between noon and 2 p.m., when they took their dinner. The length of the break depended on their exertions, but then it was back to the river until sunset neared. The first month, while still near the settlements, game was scarce. The noon meal was generally salt pork, cooked the night before, with or without a suet dumpling. (Flour, fat and water, boiled.) Supper depended on whatever the hunters had brought in, usually venison, or more pork from their stores. Parched corn, (corn fried in grease until almost burned, and then dried over an open fire) was a favorite among the men, but they tried almost anything. These included watercress, buffalo, and whatever else nature presented. The further they traveled, the more varied their diet became. After dark, if the camp was on an island, or at the mouth of a tributary, Clark and Lewis spent the evening making star sightings to fix the location for their maps. They frequently chose to camp on islands, for security reasons. 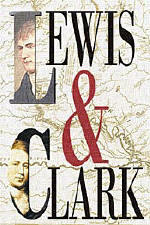 Many nights, Lewis would call out the readings, Clark writing them down. Despite the day’s labor, the nights often ended with fiddle playing and singing. Still, come the sunrise, they were ready to repeat their efforts yet another day. They would follow this schedule, with little variation, until they arrived in the Mandan Indian Village in late October. While they did not observe the Sabbath, they would, as necessary, rest along the way. July 12th was one of those days.